When it's too cold for gardening outdoors, many gardeners turn to house plants. Growing plants in the average house is a bit different from growing them outdoors, but not a difficult task. Most house plants are actually tropical plants. Many species can be grown in the average house; check the needs of each kind before taking it home. Choose plants that look healthy. Avoid plants that have brown leaf margins, many yellow leaves, wilted leaves, or spots. Don't buy a plant with damaged leaves or stems, or a plant that's been treated with a "leaf shine" product. A plant that has some young growth is a good choice. Plants with leaf and flower buds are sure signs of good health. Check the undersides of leaves for signs of insects or disease, before purchasing. Light is the most important requirement for maintaining healthy indoor plants. The intensity of light and the number of hours of light required will vary depending on the kind of plant you choose.Southern windows have the most intense light and are the warmest. East and west windows have about half the light of a south-facing window. Northern exposures usually have less than one-quarter of the light intensity of southern ones. If your windows don't have enough light for the kind of house plant you want to grow, you can supplement with artificial lights. Fluorescent lights do quite well, but you can also choose special full-spectrum lights if your plants are more sensitive. Remember, all plants require a period of darkness, so don't leave the plant lights on all night. About 16 hours of light is plenty, and less is usually sufficient. Improper watering is the cause of death for many house plants. There is no hard-and-fast rule for watering; the needs of the different plants, the potting soil, overall humidity, and temperature all affect the need for water. Water your house plants when the bottom two-thirds of the pot, where the plant roots are, start to dry out. You can't tell if a plant needs watering by looking at it. Stick your finger into the soil; if it feels dry near the bottom of the pot, water it. Water thoroughly. Let the water flow through the pot and drip out the drainage holes in the bottom. You may have to move the plant before watering to avoid damaging your furniture. Don't let the plant sit in the water that has drained; empty the saucer after it fills. For most plant types, you will need to wait until the plant is dry at the two-thirds level to water again. Some plants are sensitive to the chemicals in city water. Try watering with purified water instead. Others are sensitive to water temperature. Room-temperature water is the best choice. Houses with central heating are often too dry for house plants, even if they feel comfortable to humans. Grouping plants together will raise the humidity slightly in their immediate area. Placing plants on a tray filled with gravel or small stones and water will also increase the humidity. As the water evaporates, the air becomes more humid. Just don't let the pots sit directly in the water. Misting plants can also raise the humidity for a short time. Always mist in the morning; wet foliage at night increases the risk of disease. 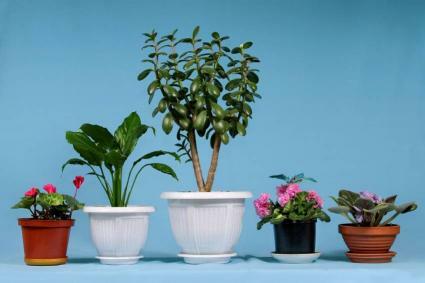 Most house plants are very sensitive to drafts, whether hot or cold. Many are also sensitive to gas or other pollutant levels in the air. The potting medium should be quite porous to provide proper drainage and aeration, but it should be dense enough to retain some water and nutrients. Many commercially prepared "potting soils" actually have no soil in them at all. Potted plants usually get their nutrients from applied fertilizers rather than from the potting medium. Like other plants, house plants require nitrogen, phosphoric acid, and potassium. Liquid fertilizers are best for plants grown indoors.